Two dozen immigrants who came to the United States illegally will be in attendance Tuesday when President Donald Trump delivers his first State of the Union speech to a joint session of Congress. 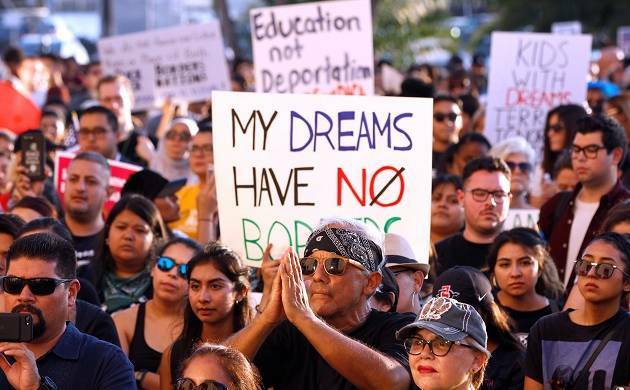 The move comes as the White House prepares to unveil its new immigration framework Monday, one that offers a pathway to citizenship for up to 1.8 million undocumented “Dreamers” who were brought to the country as children. At least 23 Dreamers will be in the public galleries in the House of Representatives chamber as guests of Democratic lawmakers, according to a list provided today by a congressional aide. House Democrat Scott Peters of California said he was “honored” to have Karen Bahena, who was brought by her parents across the border from Mexico in 2001 when she was eight years old, as his guest to Trump’s speech. Bahena, protected by the previous administration’s deferred action that is set to expire on March 5 absent a fix by Congress, graduated from San Diego State University and aspires to be a nurse. Half a dozen other immigration-related guests will also attend, including congresswoman Debbie Dingell’s guest Cindy Garcia, the wife of a father of two who was deported last week. The “Me Too” movement will also be well-represented. At least 10 lawmakers are bringing sexual assault victims or women’s rights activists as their guests, according to the list, as the nation experiences a reckoning over sexual misconduct.